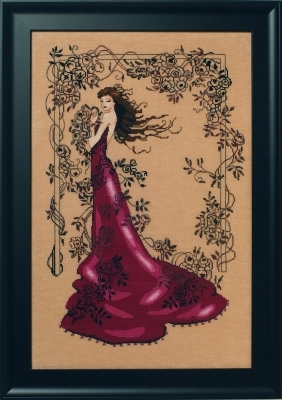 Model stitched on 32 count Country French Café Mocha Linen (85-252) by Wichelt Imports. Alternate fabric 16 count Country French Café Mocha Aida (385-252) by Wichelt Imports. 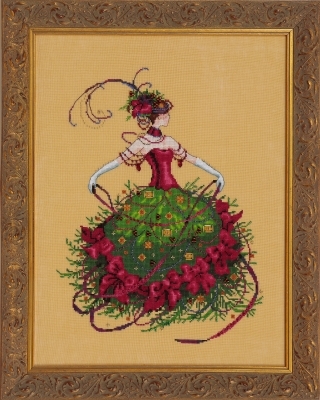 Stitched area is 10″ w x 17.375″ h with a stitch count of 160 x 278. Stitched 2 over 2.
gently like snow onto the linen. symbolizes love and good fortune. A glowing illuminating star for your own. 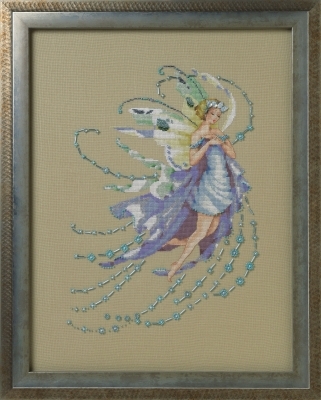 Model stitched on 32 count Natural Light Linen (65-140) by Wichelt Imports. Alternate fabric 16 count Natural Light Aida (355-140) by Wichelt Imports. covered in black onyx beads and dark wandering vines representing the tragedy that crept into her life. Her wild life was full of light and dark but she lived fiercely, creatively and with passion. 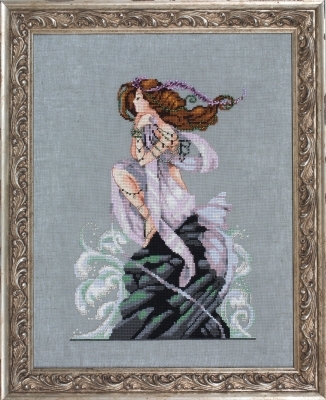 Model stitched on 32 count Graceful Grey Linen (65-320) by Wichelt Imports. Alternate fabric 16 count Graceful Grey Aida (355-320) by Wichelt Imports. Stitched area is 12.56″ w x 14.31″ h with a stitch count of 201 x 229. Stitched 2 over 2. 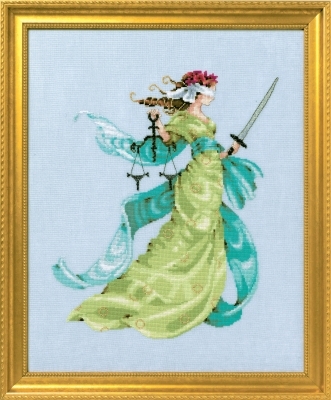 The rose crowned Lady Justice swiftly cuts to the core of truth. She has steady scales and is blindfolded for fair judgement. 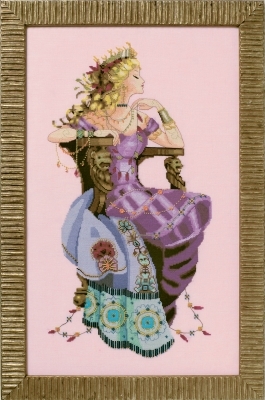 She is inspired by the Greek goddess, Themis. A classic strong female figure representing the constant battle for noble truth. Stitched area is 10.625″ w x 12.625″ h with a stitch count of 170 x 202. Stitched 2 over 2.
silver beaded celebration. She is laced with leaves and has Art Deco inspired details. especially for her and is exclusive to this pattern. 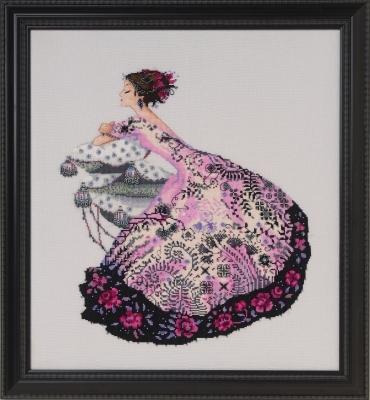 Forever dreaming in stitches, floss and beads. Alternate fabric 16 count Milk Chocolate Aida (355-95) by Wichelt Imports. 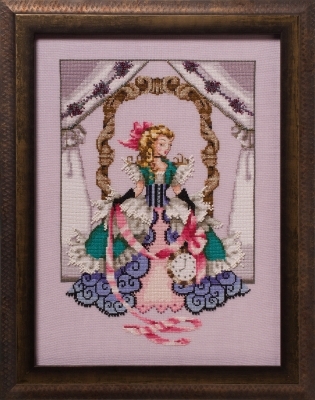 Stitched area is 10.75″ w x 19.44″ h with a stitch count of 172 x 311. Stitched 2 over 2. Stitched area is 8.75″ w x 12.875″ h with a stitch count of 140 x 206. Stitched 2 over 2.
lavender fields. Bead the glowing cinnamon fireflies dotting the fields. Even the hot fuschia shades of feathers are like flowing lava from deep within. This goddess spirit guide is designed to lead you to your inner glow. Hot, bright and beautiful, like the sun. 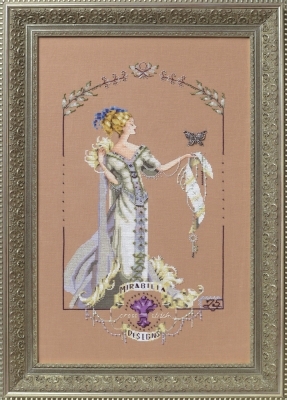 Model stitched on 32 count Touch of Pink Linen (65-302) by Wichelt Imports. Alternate fabric 16 count Touch of Pink Aida (355-302) by Wichelt Imports. Stitched area is 9.81″ w x 18.94″ h with a stitch count of 157 x 303. Stitched 2 over 2. “Off with their heads!” “Let them eat cake!” Bow Down!” “Kiss the Rings!”. 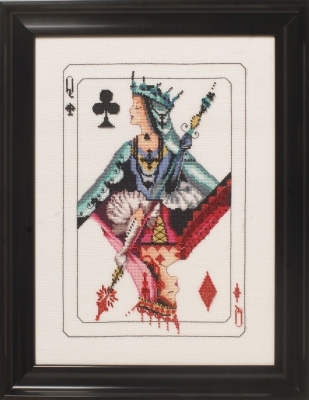 the Queen of Diamonds and the Queen of Clubs. Mirabilia pattern “Royal Games I” (MD150). two single cards or as pictured. Stitched area is 8.125″ w x 11.81″ h with a stitch count of 130 x 189. Stitched 2 over 2. She wanders through a tranquil lush garden. The air is full with the scent of warming spring earth. Handwoven silk flutters lightly over carpets of petals. Her hairpins are bright and sparkling with their myriad of twinkling beads. 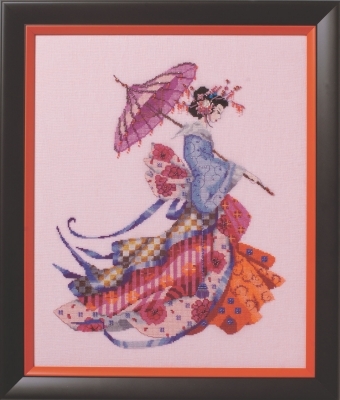 The patterns dancing on her gown reflect the pink that has covered the countryside. She moves through this “Snowstorm of Cherry Blossoms”, where all the most romantic scenes in movies are set. 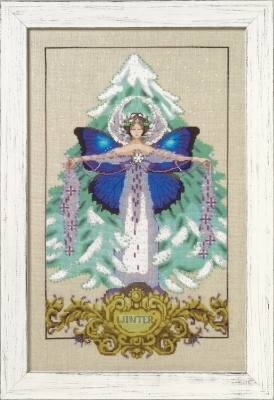 We invite you to celebrate this otherworldly blizzard of tranquility in every delightful detail of this elegant pattern. Stitched area is 11.75″ w x 14.81″ h with a stitch count of 188 x 237. Stitched 2 over 2.